You can’t discuss the topic of Irish unity without talking about what has come in history before us. People have been killed, people have been tortured, families and communities have been divided, and now as we talk about this in 2018 it can feel like things are nice and stable, but there have been so many horrific acts along the way – related to this topic. That’s why we don’t want to misjudge how heavy this topic is. 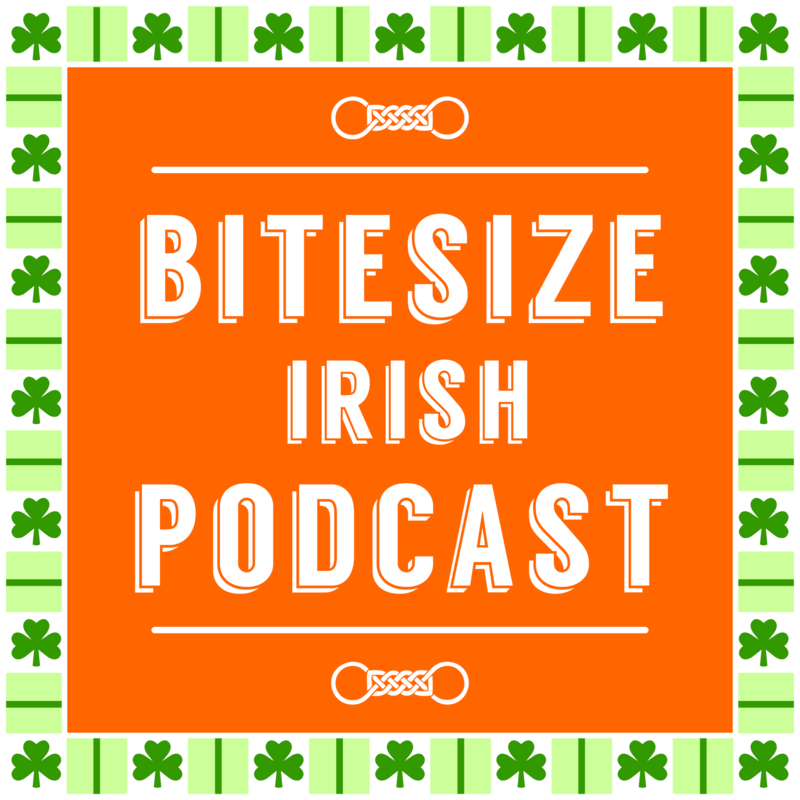 In the 76th episode of the Bitesize Irish Gaelic Podcast, Eoin talks about what would the Irish language mean to a united Ireland. 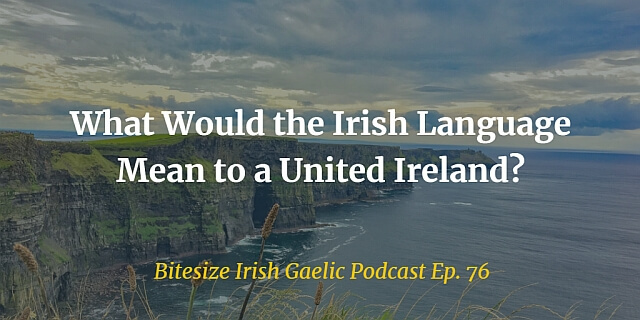 What would the Irish language mean to a united Ireland? In Star Trek: Next Generation episode “The High Ground” from 1990, Data noted that Ireland was unified in the year 2024. The episode was censored in Ireland and the UK. The show was broadcast unedited 17 years later by the BBC. Unification of Ireland is a touchy subject, has been a touchy subject, and was the subject of the Irish civil in the 1920s. People have been killed about this topic, families and communities divided. Of course, it was widespread throughout the island of Ireland for several millennia. Spread over to Scotland. Modern country borders, therefore don’t define where the Irish language is spoken. Belfast a prime example of urban Irish. Why talk about Irish unification? In 2018, it’s suddenly a contemporary issue, due to the UK leaving the European Union. Northern Ireland is a territory of the UK, at the time of recording. This is my prediction, not a vote for one outcome or another. It’s just what I’ve been wondering about. In the Republic of Ireland, the language has status in the constitution, alongside English. There’s an economic argument that a united Ireland may be not as well of economically without support of Northern Ireland from the rest of the UK. So would funding around the Irish language be even worse? Irish is a native language of Ireland (it was a blow-in language, and killed off other languages in Ireland. But after 2,000 years, it feels right to say that it’s the native language of Irish people in Ireland. So many languages in contemporary Ireland! Why support one in particular? Should they? Would road-signs in Northern Ireland get updated to be bilingual, in places? Will they continue with the UK styling of road-signs? How would they refer to Derry / Londonderry / Doire? Thank you for this thoughtful post, really interesting. For some exiles and diaspora descendents, language has become part of identity of course, but in a different context to identity on the island of Ireland. On this and other points raised here, K. David Harrison’s book ‘When Languages Die’ has a lot of relevant things to say. I wonder about the Celtic languages wiped out around Britain by the Romans. How close were they to each other and were they forms of Gaelic? Could the Brigantes of Dublin understand the Brigantes of Northumberland and Yorkshire? And what impact did the vigorous Irish incursions into dark age Britain have in terms of influencing language on the West coast? I wonder if some placenames and dialect words can be traced back to early Irish, even in places like Northumberland where the Celtic church was strong before Normans (more invaders) brought yet another language and culture into the mix. There’s the Vikings and Nordic language too. Irish must be really a robust language to survive all that and English colonialism as well. It’s a fascinating subject. Great episode a Eóin a chara. Bhain mé taitneamh as an podchraoladh agus go raibh míle maith agatsa ag freagairt mo cheist. Maybe in a future episode (and in your copious free time) it would be interested in the learning role the organizations responsible for the revival of the language since 1900. Organizations Conradh na Gaeilge https://cnag.ie/en/ whose founders background I found surprising, then there is Údarás na Gaeltachta http://www.udaras.ie/en/ and so forth. Its a culture and a history and a unique identity of the Island and I find it always a surprise those helping it, young and old, come from all sides of the social and political spectrum both now and in the past. Déanaim comhghairdeas ar do phodchraoladh is déanaí maidir le seasamh na Gaeilge sa todhchaí in Éirinn Aontaithe. You have undoubtably touched on the sensitive question of the Irish language from which one cannot separate it from politics, economics and heritage. However, you negotiated that terrain masterfully. We the Irish people through historical circumstances have been on the receiving end for millennia and through some very difficult times. The legacy left is indeed a major obstacle to overcome. I certainly do not want to politicize your podcast but questions of this nature cannot be ignored and will enter the topic given any reasons to the contrary. We must endeavour to revive the Irish language through all means possible and must certainly include Dtuaisceart Éireann. WE, the people must take it upon ourselves to enrich our culture by having the Irish language spoken throughout Ireland. No easy task having the major english speaking nations immediately to the west and the east of us. Thank you very much for discussing the topic of language in the context of a divided, or perhaps a someday unified, Ireland. I know that my opinion on unification is not significant, because I am an American rather than an Irish or British citizen. I will only express the hope that the peace which has held in recent years continues, and that Brexit does not cause a resurgence of anger and violence on the island. Regarding the Irish language in Northern Ireland, I recently read one book that offered insight that I found interesting. “Coming Home: One Man’s Return to the Irish Language” by Michael McCaughan, 2017. Are you familiar with it? I thought it offered a good perspective for an adult learner of the language, and the author also discusses the history of Irish learning in both the Republic and Northern Ireland. I assume that his observations are mostly factual and correct – do you have an opinion? Regarding the more “official” place of the Irish language in a possible unified Ireland, you make some very good points about things such as road signs as well as the identity of the people as Irish or British. From my perspective as an outsider, I can appreciate the desire to emphasize Irish Gaelic to strengthen a cultural identity. I suspect, though, that there will be resistance not only from those who think of themselves as British, but also from most of the population because they have become used to using English as the primary working language. Am I correct in my belief that an insistence on using Irish might be viewed as an attempt by a minority of the populace to impose their will on the majority? If so, then an increase in the everyday use of Irish as well as the “official” uses of the language may need to be a careful process to avoid active resistance.